A helpful feature of Picasa Web Albums is that when you view photos, they're automatically resized to fit your browser. We always display the largest-size photo that will fit inside your browser window, up to 1600 pixels if you have a nice big display. This resizing happens behind the scenes and doesn't require any input from you. Here's how it works: when you upload a photo to Picasa Web Albums, our photo servers store it and create a couple of smaller versions of the photo. 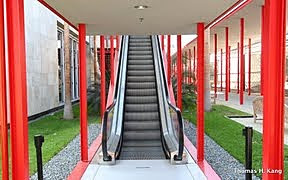 Later, when you click to view a photo, your browser sends a request to the servers asking for the version that will fit best. If the size matches one of the stored versions, that one is served directly. But if the request is for some in-between size that doesn't exist, the servers create it on the fly. And of course, the resized photo always preserves the size ratio of the original so it's not distorted, and we don't scale photos to be larger than the original. As you can imagine, all this server processing can get pretty intensive. Because loading your photos as quickly as possible is really important to us, until now we streamlined our servers to just resize the photo and send it out right away. But since we recently implemented some optimizations that made Picasa Web Albums much faster overall, we decided to take advantage of the new speed improvements by doing a little extra processing to improve the look of our photos. A well-known issue with all digital photos is that when a photo is resized, the sharp corners and edges look softer from the color blending that occurs. The standard fix for this is to apply a sharpening filter, which brings dulled edges back into razor-sharp focus. As long as you're careful not to over-sharpen, this can help resized photos look much clearer. From our extensive testing, we found that adding a little bit of sharpening can make a subtle but noticeable improvement in the visual quality of resized photos in Picasa Web Albums. So we recently added some logic to the server processing code that adds the appropriate amount of sharpening when necessary, before sending it out to the browser. We also reduced the image compression slightly to help preserve the clarity of the fine details in the photos that the sharpening brings out. 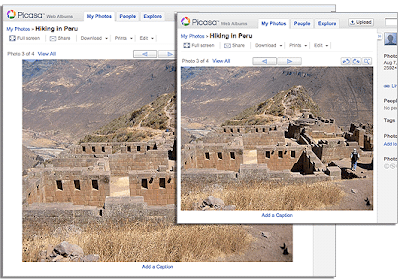 To make sure you don't notice any latency impact on your Picasa Web Albums viewing experience, we're only applying sharpening to newly uploaded and smaller versions of resized photos for now. And just to be clear, we never alter your original photos – we just create new versions as needed whenever we resize and sharpen. These sharpening and image compression improvements are our first step towards improving the quality of all images in Picasa Web Albums. We're committed to making your photos look as good as possible, and we're investigating other ways to improve the visual quality of your photos without impacting site performance or excessively altering the look of your original photos. On behalf of the entire Picasa team, happy holidays! Take lots of pictures as you gather with your friends and family to celebrate the season, and we'll see you next year.